Quick & Easy Repairs – Done Direct From Our Office! What is Remote Desktop Computer Repair & Maintenance? This is a service where we perform computer to computer diagnostics and operating system (or other computer software repair) over a secure Internet connection. This is done from our Network Operations Center to your business or home location, to your server, network, or PC. You must have a high-speed Internet connection (Internet Cable or ADSL) in order for us to be able to connect with your computer. 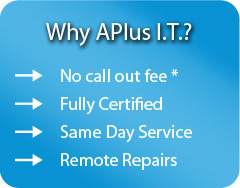 80% of all computer problems are either operating system and/or software related and can be diagnosed and repaired using APLUS I.T Remote Desktop Computer Repair & Maintenance service. Simply contact our friendly team for assistance and we’ll take great care of you! What Can We Do Remotely? How Secure Is The Service Over The Internet? We utilize a 256 bit encryption process, the same as your bank or financial institution uses. It is totally safe and secure – and, we can only access your computer if/when you let us. You can see us control your desktop and you may terminate the remote session, on your end, at any time you wish. The charge per incident is $35 per half hour (minimum 1/2 hour). Normally, it is much cheaper and faster than having a physical “On-Site” service call made to your business or home residence. How Will I Pay For The Service? We accept VISA, MASTERCARD and BANKCARD. You will be asked by a service technician for your credit card information. After the information is obtained the Remote Desktop Computer Repair & Maintenance Service session will start. You will not be billed for the service unless we have taken care of the problem remotely for you. That’s our 100% guarantee. For those times when a “physical on-site” service call is necessary, and/or if we cannot repair your computer using Remote Desktop Computer Service, we will be happy to make an “on-site” service call and credit you for any repair work performed where Remote Desktop Computer Repair & Maintenance Service was implemented. At present our Remote Desktop Computer Service is available Monday – Friday, 9 am to 5:30 pm. If a technician is not available, you can call us to set up an appointment for a Remote Desktop Computer Service session on 07 5534 7002. We all need our computer. Copyright © 2019 APlus I.T. All Rights Reserved.